These systems require minimal changes to the usual Western fare. 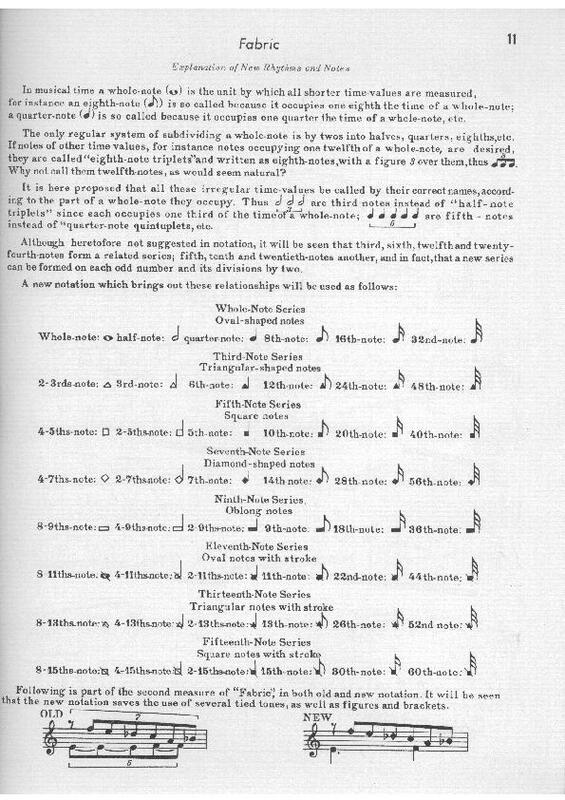 This system adds accidentals to conventional notation in order to support 72-ET. Its use is advocated by the Boston Microtonal Society. This is basically the practice of assigning just intonation ratios directly to notes, along with a way to specify root changes, which function much like key signature changes for the ratios. It could in principle be used together with many of the notation systems described here. Below are two examples of its use on top of conventional notation. Notes are simply marked up with cents deviation values from standard notation (12-ET). Johnny Reinhard suggests 1-cent precision. Deviations should generally be less than 50 cents +/-, with perhaps a few exceptions for readability. These systems draw their nominals from a single chain of identical intervals. Accidentals indicate comma inflections on these nominals. These support more or fewer than 7 nominals, though apparently the chained interval is always an approximate 3:2 and the number of nominals is constrained to be a MOS of the chained interval. Erv also demonstrates a clever staff to hold the notes. This is a family of linear notations based on a 7-nominal chain of very close (if not exact) 3:2 fifths. A set of commas is then identified, and an up/down pair of accidentals is assigned to each. HEWMs differ in the particular commas they call out for this purpose, as well as the glyphs used. Conventional notation can be seen as a HEWM with a single pair of accidentals that map to different commas depending on the musical context. Sagittal is a standardized set of accidental glyphs for a large collection of commas. It supports a wide variety of tempered intonations, and is said by its creators to be optimal in several respects. It is most often used in a HEWM-like manner, but permitting a wider range of fifth sizes. Like linear notations, but nominals are assigned to a set of pitches that can only be traversed using TWO different just intonation intervals. This system has 7 nominals, based on the standard 5-limit diatonic scale in just intonation, with accidentals for commas like 81/80. It is often criticized as being too confusing to use, but nevertheless served for magnum efforts like Toby Twining's Chrysalid Requiem, to say nothing of Johnston's own music. Proposed by tuning theorist Graham Breed. Designed specifically for magic temperament and generally for systems where 225:224 is tempered out. One version requires dashed lines for dummy staff positions. For any scale of 5-10 notes/octave, notes are named in order using letters A-J as necessary. These nominals fall consecutively on the lines and spaces of a staff. If a scale step pattern yields a consonant chord in different modes of the scale (e.g. 1-3-5 in the usual diatonic scale) then those chords look alike on the staff (e.g. major and minor triads). As in the above systems, comma inflections are notated with accidentals. Common-practice notation can be seen as a heptatonic diatonic notation tuned in 12-ET.